It’s time for Snapshot Saturday again. Hosted by Melinda at West Metro Mommy. Be sure to check out the other photos of the day over there when you’re finished here. This is probably my last photo from my collection taken at the local nursery earlier in the summer. I think I’ve run through them all. I tried to get a bit fancy with this and I think it turned out pretty well. Not sure why, but there were doves in a cage at the nursery. I tried to get him/her centered in the photo without the bars. They’re sort of there…like “ghost” bars. I like the touch of color that I captured in the background. It’s funny that on July 4th when I was at my sister Ele’s house, we were talking about birds and looking them up in her bird book. I’ll have to let her tell me exactly what this one is. Thanks, Christine, I really appreciate that! Enjoy your weekend! I do like the “ghost bars.” And the hint of color in the background. Thanks for capturing the image and sharing it. And thanks for visiting my blog. Have a great weekend. Glad you like it, Laurel. Thanks for visiting! Enjoy your weekend! My kids love going to our local pet store and looking at the birds. There is this one parrot that is so loud and crazy, of course they love him the best! Hi Marie! I think birds are fascinating. I love watching them in my back yard. I’ve made friends with a catbird. He/She follows me around the yard and “mews” at me. So cool. Have a great day! Thanks, Bob! That means a lot coming from you! A very beautiful bird. Lovely shot. I love that puffed up breast! Such a pretty little bird! Thanks, Susan, I thought it was so pretty! 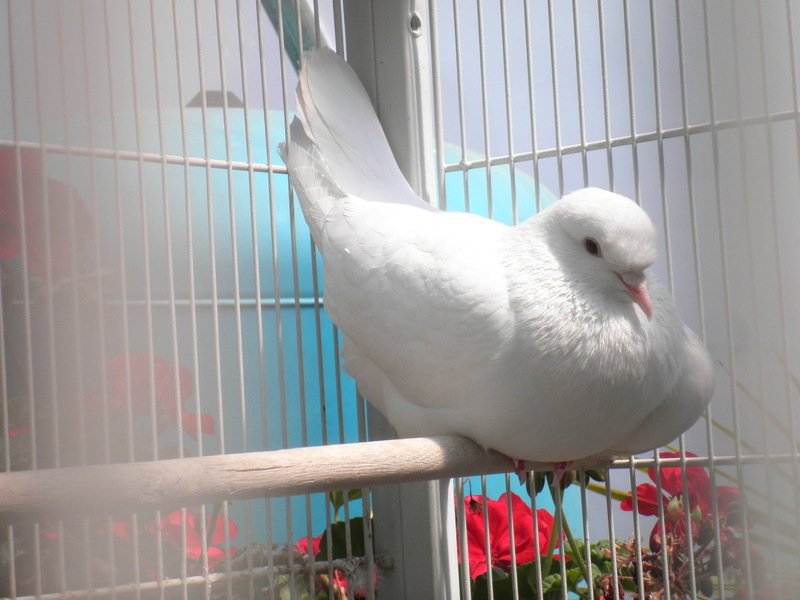 Doves at a nursery is a little different. On the same note, our local garden store has guinea pigs. This is actually where I bought my first, while the others came from shelters. I like the ghost bars too. Did you ever find out the specific name of the dove? No, Allison, I never did find out what it is. I have to check with my sister who is the bird expert around here. I guess it’s not that unusual to have the birds there. I just hope they’re not Still there with the heat we’ve been having. Have a great day! Very nice. The ghost bars give it a dreamy look and the turquoise in the background is great! Thanks, Joy. I didn’t realize how much I liked the photo until looking at it again after about a month. I think that’s often the way with photos. Have a great day! Wow, that is a big bird and unusual to see in a nursery. It’s cool you did, and I agree; I like the pop of color in the background. Thanks, Meghan, I thought it was a good one.